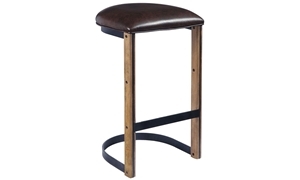 Bar stool flaunts a sleek steel base accentuated with honey blonde wood, and a half round seat tailored in tonal brown leatherette. 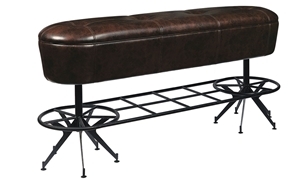 Seat up to three on this 60-inch tufted counter height bench tailored in tonal brown leatherette with a sleek metal base and foot rail. 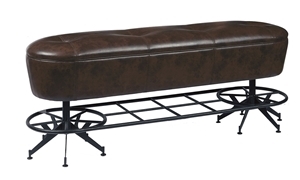 Seat up to three on this 60-inch tufted bar height bench tailored in tonal brown leatherette with a sleek metal base and foot rail. 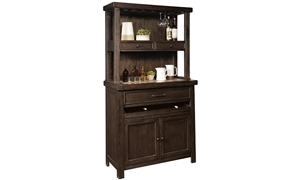 Cabinet includes concrete-top server and hutch in a matching stout finish, featuring racks for both fine stemware and bottle storage. 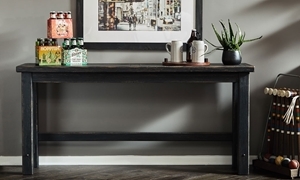 Bar table in a deep stout finish is always ready to entertain with an open shelf, drawers and a cabinet, plus industrial pipe footrest. 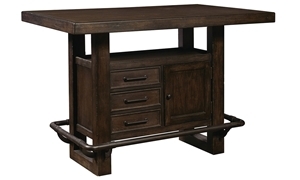 78-inch tasting table crafted with hickory veneers in a distressed stout finish can also function as a dining room server or sofa console. 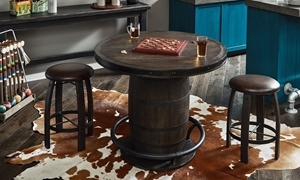 44-inch round gathering table with barrel-shaped pedestal in a dark stout finish, equipped with metal footrest and riveted apron detail. 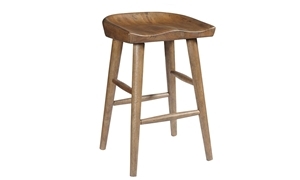 Rustic counter height stool offers simple style and comfort with a saddle seat and tapered legs in a warm, honey blonde finish. 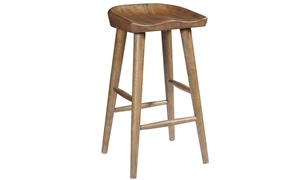 Rustic bar stool offers simple style and comfort with a saddle seat and tapered legs in a warm, honey blonde finish. 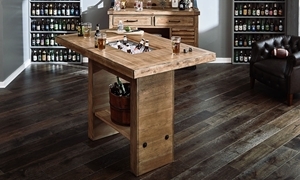 Slab top bar table in a warm, honey blonde finish keeps cold drinks close at hand with a built-in aluminum cooler in the center. 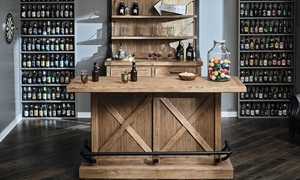 Bar in a distressed, honey blonde finish features a metal footrest and bottle openers on both sides, plus drawers and shelves for storage. 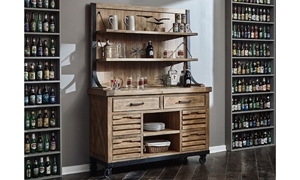 2-piece cabinet in a honey blonde finish with industrial metal accents and locking casters offers ample storage and display options. Whether you need to furnish a large dining room for big holiday parties, or simply add a trendy bistro table to your balcony for coffee in the mornings, we have everything you need here at Haynes Furniture to create the dining space you’ve always wanted.